Summer holidays are bringing relief to American parents as well as students, for a shocking reason: gun violence. As of the May 18, 2018 Santa Fe school massacre, more people have been killed at school this year than those killed serving in the military. 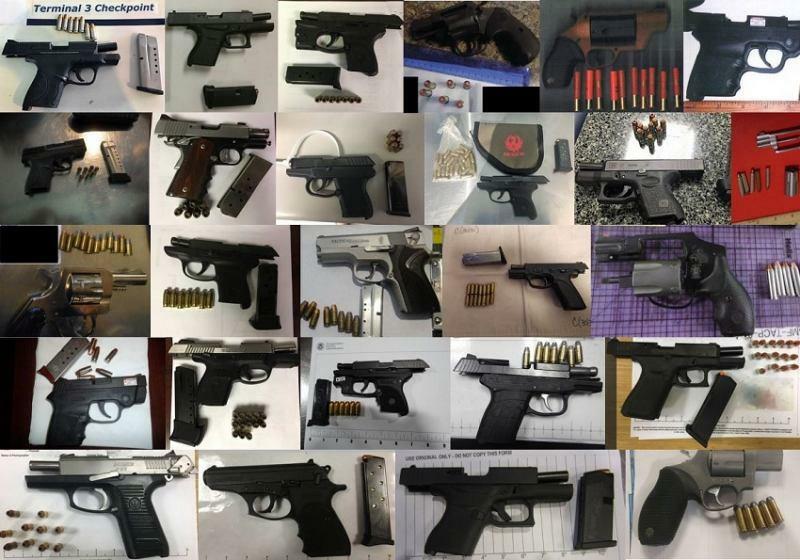 These weapons were found in the U.S. by airport security in carry-on luggage, during one week. Photo c. TSA Blog. Travelers wonder what risks they can expect from gun violence while traveling in the United States. What they can expect, by most analyses, is an encounter with a gun. After two decades of school mass killings (the Columbine massacre took place April 20, 1999), not only has the number of shootings increased, but experts say that each shooting results in increased ownership of guns, too. According to Politifact, the most recent reliable surveys put the number of guns in the U.S. at 265 million. More recent surveys suggest that there’s at least one gun in 32% to 42% of American households (depending on which survey you trust), a number that has been steady for several years but now represents more weapons as the population has grown. Since about two-thirds of gun owners have two or more guns, this adds to the volume of weapons available to anyone. Why are we writing about guns and travel? I know that just writing about this issue is a controversial act. But it should not be. Family Travel Forum thinks it is our duty to inform parents of risks they may encounter, especially when traveling, so they can calculate the risk-benefit ratio. That applies to domestic as well as international family vacations. Additionally, a recent notice from the government of Canada alerting American travelers to Canadian gun laws reminded us that Americans’ misuse of weapons is making neighbors afraid, too. If Canada and Mexico, with whom the U.S. shares land borders, are afraid, maybe every other country should be as well. If that sounds ridiculous, news such as the record-breaking volume of 104 loaded weapons found February 5-11, 2018 in hand luggage by the TSA – the week before the Parkland High School shooting – suggests other countries have reason for concern. There are currently 44 U.S. states that allow people to carry weapons out in the open. The so-called “open carry” states allow anyone to display their gun in public, at the mall, in movies theaters, even at the pool or local theme park. While several states permit private businesses to deny admission to anyone carrying a weapon – and you can see this notification on the websites of many tourism businesses in open carry states – some do not allow any restriction of personal freedoms. Knowing the states in which residents freely carry guns will allow you to discuss weapons, their use and the very poor chance of self-defense with your kids. Or, give you enough time to order a Kevlar backpack for each family member. In a majority of states, it is legal for an individual to openly carry a loaded firearm in public without a permit, notes the Giffords Law Center. While we believe this is bad policy, bad things can happen in good policy places as well. Having some fast facts about open carry states should be useful travelers to and within the United States. District of Columbia, or Washington, D.C.
1 state – South Carolina – restricts the open carry of handguns but allows long guns (rifles, shotguns) to be carried openly. 8 regions – the five above plus Massachusetts, Minnesota and New Jersey – generally ban the open carrying of long guns. 44 states allow the open carrying of a long gun, although in five of these states there are some restrictions (such as weapon being unloaded) in place. 31 states allow the open carrying of a handgun without any license or permit, although in five of these states there are some restrictions (such as weapon being unloaded) in place. 15 states require some form of license or permit in order to openly carry a handgun; the Giffords Law Center has all the details. Safe travels! Let us know how Open Carry laws and gun sightings affect your choices about where to vacation this summer in the Comment Field below.